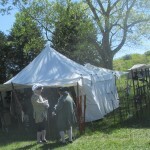 One of my favorite events is the Fort Frederick Market Fair. 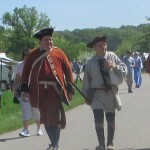 This event held annually at Fort Frederick State Park. 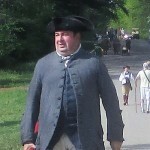 This is a Maryland state park surrounding the restored Fort Frederick, a star fort active in the French and Indian War and the American Revolutionary War. 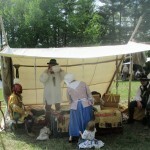 The market fair is a combination reenactor’s shopping mall and living history encampment. I like to start out browsing through the trade blankets in the camp to see what used items are available, then spend much of the rest of the day perusing the 140 or so period sutlers. 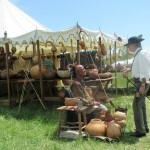 A wide variety of goods is available. The event is open to the general public. 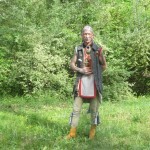 There is also a lot of entertainment, with traveling performers roaming the grounds doing magic tricks, playing music and performing comedy routines. 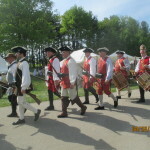 In the fort itself, an F&I period regiment of Maryland militia drills and marches about. 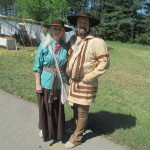 I wasn’t feeling well this year, but I still managed to have a good time. I definitely intend to be there next year. 2018’s event will take place from April 26 through the 29th. 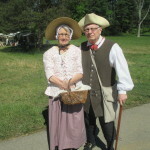 See http://www.friendsoffortfrederick.info/market_fair.htm for details.